Argentina is a large country that can boast over 300 sunny days a year and a dry semi-desert climate, and irrigation canals from the Andes mountains which helps them to be the 5th largest wine producer in the world. Grapes were brought over by French, Spanish, and Italian immigrants. Believe it or not, nearly 70% of the vineyards are cultivated with white varieties and 25% red varieties, with the remaining 5% going to table grapes. It is interesting that he hardest grape to grow and ripen successfully in the Old World, (Bordeaux, France), is Malbec, and has become Argentina’s most recognized grape. It is also quite surprising that the grapes in Argentina thrive in the high elevations, with Mendoza being at 1500 m asl (5580 ft asl). From a quick check on Wikipedia I believe the average elevation in Bordeaux is 61m asl (200 ft asl). There are over 1200 Argentine bodegas producing wine, but around 400 export. The USA is the Number 1 export market, and Canada is in Number 2 spot! What is a Kaiken? 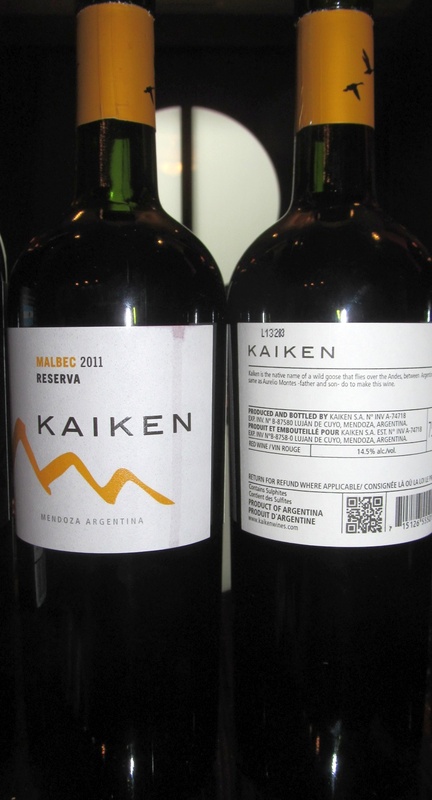 Just in case you were wondering, a Kaiken is the name of a wild goose living in the south of Argentina (think of the Canadian goose, but Argentine style). 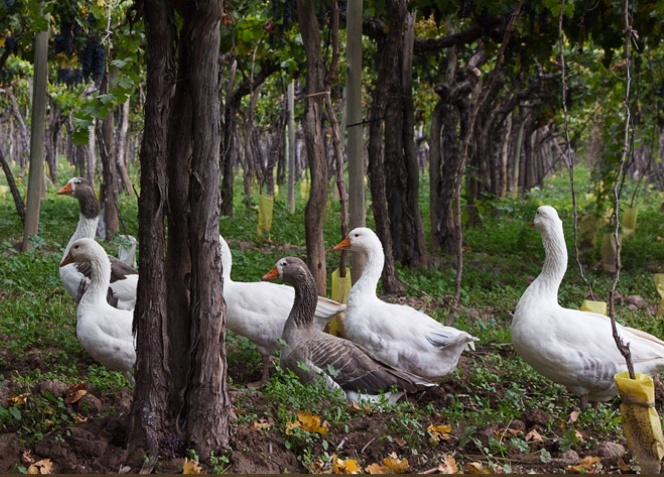 The bird regularly crosses the border between Argentina and Chile, and that is just what Montes is doing. Thus the name! 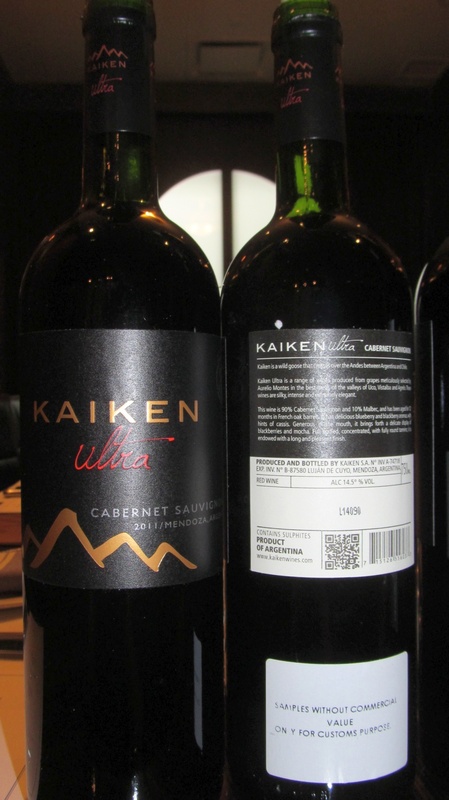 Viña Kaiken, is a relatively new winery, started in 2002, located in Vistalba, a few kilometers south of the City of Mendoza. That is not surprising. What is, is that the winery was started by Aurelio Montes, and his son Aurelio Montes Jr., who are from Chile, and have their well-respected Montes winery. Aurelio Montes is always looking for new terroirs, I’ve been told, and found this area on the opposite side of the Andes from his home country. The vineyard they purchased in Vistalba had already 80-100 year old Cabernet Sauvignon and Malbec vines. 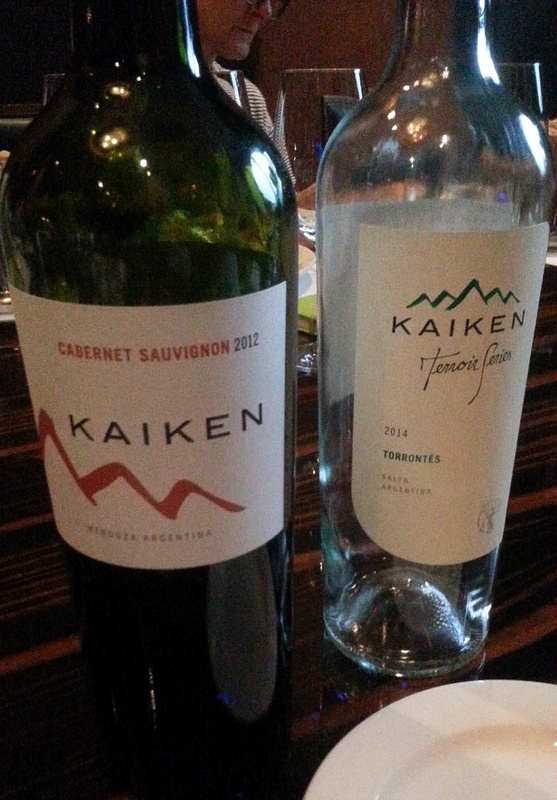 One of their goals was to show that Malbec can produce a wine with finesse and depth, which will lead us into the tasting I had of Viña Kaiken’s wines, here in Vancouver at the Tableau Bar Bistro. Besides these 2 grape varieties the Montes family planted Bonarda, Petit Verdot, and Torrontes. From 2010 onward, it is Aurelio Montes Jr who has been administering Viña Kaiken, and became an Argentine, living there with his wife and children. Aurelio Montes Jr. knows the wine business well, having graduated at the Catholic University in Santiago de Chile as an agronomist specialized in wine growing. He worked at Rosemount and Cape Mentelle in Australia, stayed at Franciscan Estate Winery in Napa Valley, spent time in Burgundy, and worked at a competitor winery in Chile, Viña Ventisquero. 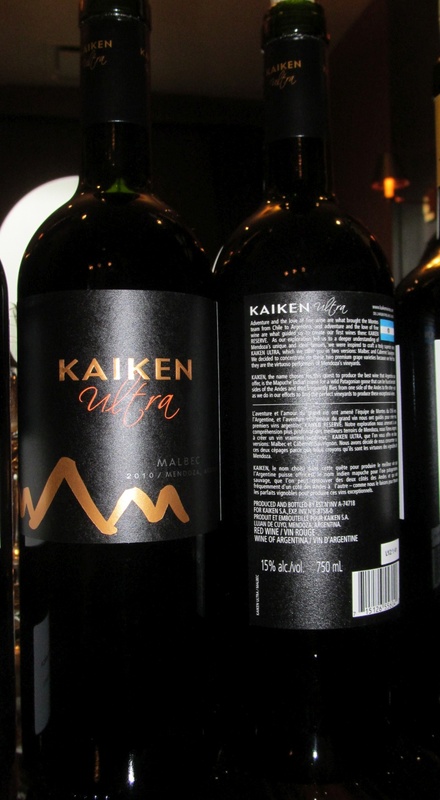 The vision for Viña Kaiken is to produce premium wines, and expressing the diversity of terroir in their wines. Their vineyards are located in Vistalba (lower slope of the Andes), at Agrelo (the valley south of the Mendoza River), and in Vista Flores (rocky upper slope of the Andes) in the Uco Valley. Let’s get on with a review of their wines! All the grapes for this wine are kept in the shade, which Aurelio mentions keeps the grape skins from burning and producing the bitter flavour from Torrontes. Aurelio likes to keep the wine style to have a Torrontes nose and Sauvignon Blanc flavour. These grapes are from old vines in Cafayate and have cool weather making the best Torrontes grapes in Argentina. Oranges, tropical fruit and flowers on the nose and palate. Nice acidity. It paired nicely with the salad. You had the oranges and acidity from the wine to compliment the crunch of the kale, the creamy dressing, and the sweetness of the beets. This and the Malbec are aged for 6 months in French oak from 2-4th fill. The oak is light/neutral and lets the fruit be more forward. Opaque garnet in colour. Light intensity nose, with cassis and lees. Dry, round with medium body. Purple fruit, peppery in the start and gets more peppery by the finish. Mineral streak. Meaty, tomato, and dark fruit aromas. Dry, soft and silky in the mouth. Lighter mouthfeel, with minerality and nutmeg, chocolate and prune flavours. Also get some pepperiness and flowers. When I tried this with the Parmesan cheese, it brought out some smokiness in the wine. A more complicated wine than the Cabernet. The “Ultra” line comprises 3 full-bodied wines which could correspond to Montes’ “Alpha” series in Chile. The Cabernet comes from the 80 year old vines of Vistalba (80%) and the remaining grapes from the Arboles? region. This wine has a very concentrated nose with sweetness, ripe dark fruit, and vanilla. Full bodied, with ripe cassis and dark fruit flavours. Very peppery. Fine tannins. Some mouth watering acidity on the finish. I really liked this wine. 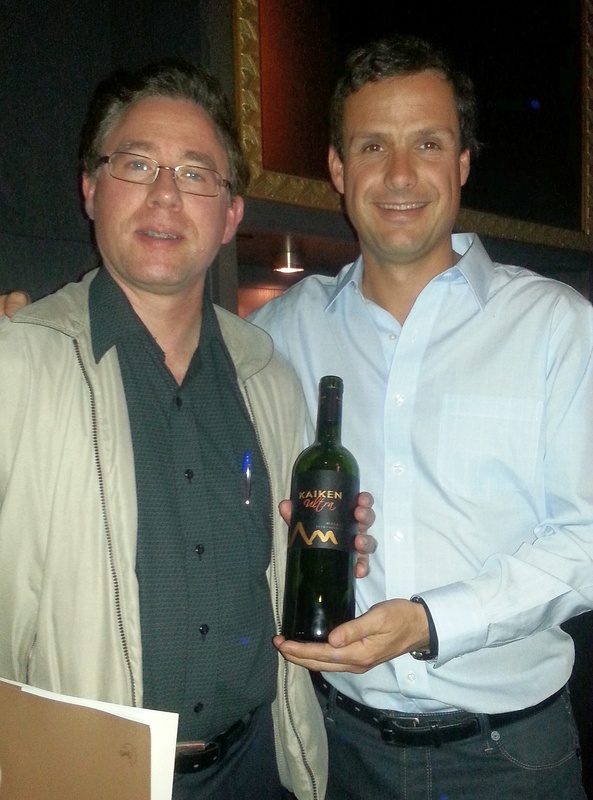 Aurelio recommends that you have a slow oven roasted beef with herbs to go with this wine. Just noticing the year, this would be Aurelio Montes Jr’s first vintage in Argentina and first try at Malbec. The grapes come 100% from the Uco Valley, high altitude gives acidity, minerality, and spice. Dark, ripe candied cherries and dark, ripe sweet fruit on the nose. Full body, with purple fruit, and roses. It has spice, but it is not overpowering, shows up at the mid palate and disappears before the finish. Fine tannins, some minerality, and balanced acidity. Aurelio recommends this wine with a big bbq. The charring on the meat goes nicely with the Malbec. Before this wonderful tasting event, I had the chance to briefly interview Aurelio Montes Jr. Watch my youtube video with Aurelio Montes Jr. here.